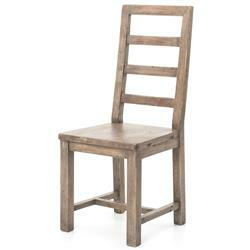 Bring the farm to your kitchen with this rustic wood dining chair. Whether nestled in a breakfast nook or tucked beside a sprawling dining room table, this chair is the perfect candidate to introduce a touch of country charm to your home, whether you are living in a modern city loft of a rugged mountain lodge. The light, sun-bleached brown finish on the stately ladder-back chair complements a wide variety of color schemes and displays plenty of natural wood grain for an authentic farmhouse appeal.